Do you ever get tired of social media? I know I do. That may seem like a strange admission for someone who spends a chunk of their time helping businesses harness its potential. Nonetheless it is true. Take today, for example. Facebook is throttling back the organic reach of my pages again… strong-arming me into paying to connect with communities I’ve spent years nurturing. Disillusioned I head over to twitter, only to find my feeds replete with 140 character bursts of mundane irrelevance. That, and links to content whose only noteworthy trait is how utterly un-noteworthy it all is. It’s not always like that, of course. But mining the growing mountain of dross to unearth scant nuggets of social media gold gets tiresome. It’s easy to become disenchanted, to the point that sometimes I find myself wondering if it’s still worth the effort. I bet, if you’re honest, you do too, and you can be damned sure that your customers do. 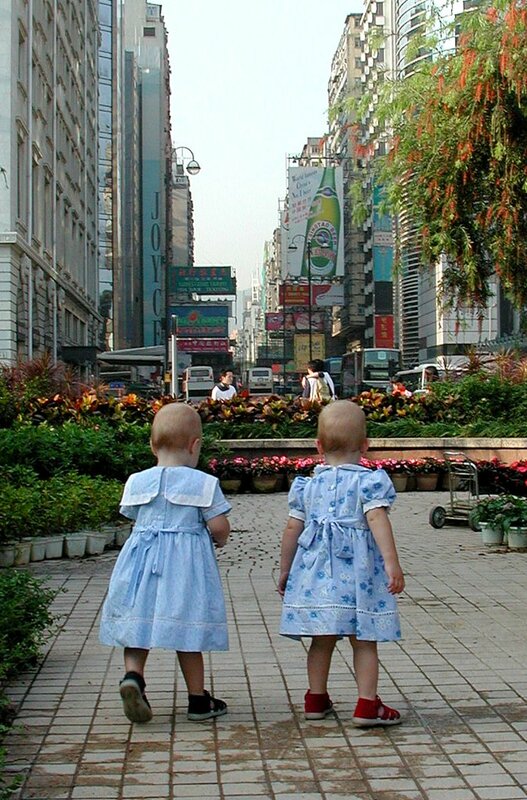 The twins “discovering” the wonders of Hong Kong at just over a year old. When my twin daughters were very young I’d watch them explore the world around them full of wonder and delight at the new discoveries they made every day. It was a joy to be a part of. In its infancy social media was a bit like that: it was new to everyone, full of potential, unknown and exciting. Back in the day social media platforms seemed full of interesting people engaged in thought provoking discussion on every topic imaginable. We were explorers back then, sharing ideas, posting links to remarkable content and engaging productively with more people than we ever thought possible. This was prospecting on the frontiers of collaborative possibility, and it was a wonderful place to be. Let’s fast forward a little, and stretch our original analogy. The twins have just turned 15, and stomp through life with the singular disinterest of surly teenage girls. Growing up is a challenge, for them and for us. The road through adolescence to maturity is bumpy, with many a twist and turn along the way, but the destination ultimately makes the rigours of the journey worthwhile. 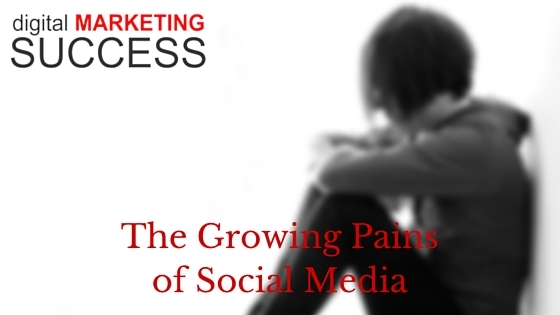 Social media is also growing up… and it’s not a painless transition. When social media works well (or when you “work” social media well… depending on your perspective), it can deliver outstanding results for your business. But connecting with the people who are important to you online isn’t as easy as it used to be. Ironically, one of social media’s real strengths, it’s almost universal appeal, is also proving to be its Achilles heel. We’re social creatures, so technology that enables interaction between more people was always going to strike a chord with a massive chunk of the online population. But as more people jump aboard the social media juggernaut (it outgrew the bandwagon moniker long ago) it’s becoming a very congested and noisy place. Bizarrely as the social media population expands, organic reach across social media for most individuals and businesses is contracting. Social media is becoming the newest incarnation of mass media, its burgeoning “audience” attracting prospectors of a different kind. There’s a perfect storm brewing: a three pronged deluge that’s diluting the effectiveness of your social media engagement. Mass-media-style marketing: mass-media marketing junkies, eager to exploit the sheer scope of the social media “audience”, are flooding networks with low-quality spammy content and irrelevant offers. Paid advertising: understandably social networks are pushing their advertising products to boost revenue. Social media advertising can be a great way to cut through the noise and reach a highly targeted audience… but it plays into the hands of big brands with deep pockets. Poor advice: “training” is the new big thing online. The ability to learn new skills on-demand is fantastic. But as technology lowers the barriers-to-entry for online learning self-styled “experts” are clamouring to sell you what you want to hear, rather than teach what you need to learn. A+B=C is straightforward and easy to understand. It’s like a recipe for your favourite cake. Take the same set of ingredients, follow the instructions and you’ll get a similar outcome every time. Pass that recipe to a friend and they can easily replicate your results. Simple. And it works… for cake. But I have a problem with the notion that a single “recipe” can work for everyone when it comes to social media. Effective social media marketing demands an understanding of the unique relationship between your customers (or potential customers), your business and the value you bring to the table. That relationships is, by definition, UNIQUE. While it may sell a lot of online courses and e-books, one-size patently does not fit all. And yet people continue their ceaseless quest for a social media magic bullet. They follow one recipe for success after another… churning out copycat content and formulaic drivel, and wondering why it doesn’t deliver. It’s an unfortunate but all too demonstrable fact that, when a lot of people gather in the same place… online or off… there’s a tendency to descend to the lowest common denominator. There’s an urge to belong, to fit in, to be a part of the collective. Instead of following our convictions and striving to stand out by doing something remarkable, we capitulate, emulate and conform. It’s human nature. We strive to be like everybody else… and in doing so we fade into the homogenous whole. I see this happening across much of today’s social media landscape (and online content in general, come to that). There’s an epidemic of “as good as”, when in truth “as good as” is never good enough, especially when the benchmark tends to be alarmingly low. So how do you stand out amidst the tidal wave of mediocrity that’s sweeping across social media today? I don’t have an answer, because there isn’t a single answer. It depends on the myriad variables that define the complex relationship between your business and your customers. Understand your customers, your business and the value you offer: an old chestnut, I know — but essential for all of your marketing endeavours — social media included. Find your authentic voice: stop striving to blend in with the homogenous masses, be remarkable, be unique, be yourself. Never accept mediocre: good enough is never good enough. Your contribution to the social media conversation is a direct reflection of your business; strive to make it the best it can possibly be. Focus on value: you know what your customers want and need — so help them find it. Less can be more: don’t be drawn into the volume game at the expense of quality. Quantity and consistency are important, but where resources are limited you have to strike a balance… and you should always err in favour of quality. How do you see the social media landscape evolving? Does my perspective strike a chord, or is your experience completely different? I’m looking forward to chatting about this at CongRegation, but in the meantime I’d love to hear your views in the comments below, or via @WriterCJ on Twitter. Creating and sharing posts that are “as good as” is never good enough. Recipes are for cakes… there’s no such thing as a “one size fits all” formula for social media success. Cutting through the social media noise requires an understanding of your community, and how you can help solve their problems in an authentic and remarkable way.